ANN ARBOR–A rechargeable battery technology developed at the University of Michigan could double the output of today's lithium ion cells–drastically extending electric vehicle ranges and time between cell phone charges–without taking up any added space. 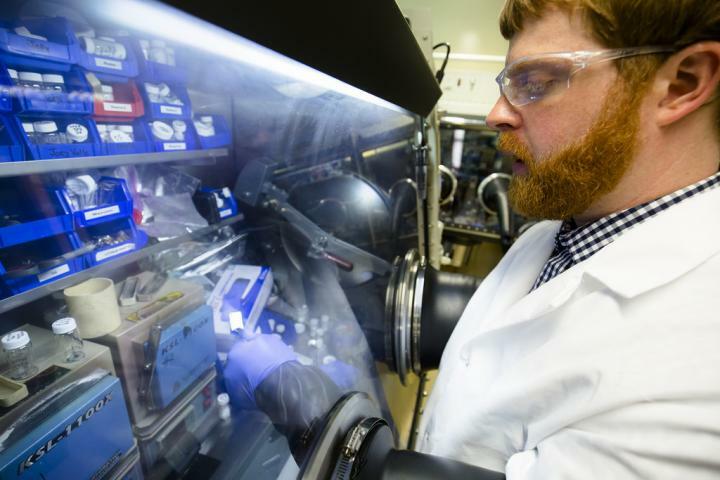 "This could be a game-changer–a paradigm shift in how a battery operates," said Jeff Sakamoto, a U-M associate professor of mechanical engineering who leads the work. To solve lithium metal's combustion problem, U-M engineers created a ceramic layer that stabilizes the surface–keeping dendrites from forming and preventing fires. It allows batteries to harness the benefits of lithium metal–energy density and high-conductivity–without the dangers of fires or degradation over time. <p>&quot;What we've come up with is a different approach--physically stabilizing the lithium metal surface with a ceramic,&quot; Sakamoto said. &quot;It's not combustible. We make it at over 1,800 degrees Fahrenheit in air. And there's no liquid, which is what typically fuels the battery fires you see.</p>      <p>&quot;You get rid of that fuel, you get rid of the combustion.&quot;</p>     <p>In earlier solid state electrolyte tests, lithium metal grew through the ceramic electrolyte at low charging rates, causing a short circuit, much like that in liquid cells. U-M researchers solved this problem with chemical and mechanical treatments that provide a pristine surface for lithium to plate evenly, effectively suppressing the formation of dendrites or filaments. Not only does this improve safety, it enables a dramatic improvement in charging rates, Sakamoto said.</p>    <p>&quot;Up until now, the rates at which you could plate lithium would mean you'd have to charge a lithium metal car battery over 20 to 50 hours (for full power),&quot; Sakamoto said. &quot;With this breakthrough, we demonstrated we can charge the battery in 3 hours or less.</p>   <p>&quot;We're talking a factor of 10 increase in charging speed compared to previous reports for solid state lithium metal batteries. We're now on par with lithium ion cells in terms of charging rates, but with additional benefits. &quot;</p>   <p>That charge/recharge process is what inevitably leads to the eventual death of a lithium ion battery. Repeatedly exchanging ions between the cathode and anode produces visible degradation right out of the box.</p>    <p>In testing the ceramic electrolyte, however, no visible degradation is observed after long term cycling, said Nathan Taylor, a U-M post-doctoral fellow in mechanical engineering.</p>   <p>&quot;We did the same test for 22 days,&quot; he said. &quot;The battery was just the same at the start as it was at the end. We didn't see any degradation. We aren't aware of any other bulk solid state electrolyte performing this well for this long.&quot;</p>   <p>Bulk solid state electrolytes enable cells that are a drop-in replacement for current lithium ion batteries and could leverage existing battery manufacturing technology. With the material performance verified, the research group has begun producing thin solid electrolyte layers required to meet solid state capacity targets. The group's findings are published in the Aug. 31 issue of the Journal of Power Sources.